OK forget the credit crunch, let's have some fun, get the baubles and the tinsel out and let's have some fun with your Xmas pictures. Send us your Xmas photos. Here's a few to start you off. The lovely boy at the top is our Ted who sadly died in September 2015. We miss him so much, he left us when he was way too young. 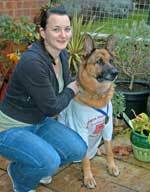 Congratulations to Louise for completing the St Albans half marathon and raising £166.30 for GSRescue. Sabre supported her all the way - and got to wear the T-shirt and medal! 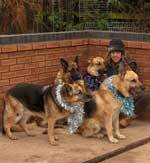 A big thank you to Louise and Sabre for raising money to help the rescue. You can both put your feet up now for a well-deserved rest. 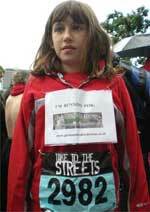 This young lady ran the Junior Great North run to raise funds for German Shepherd Rescue. Isla raised £110 and did it in 22mins 56 second. What a fantastic achievement, well done. Isla didn't even look tired at the end fo the race. I reckon we have the next Paula Radcliffe here. A big thank you to Isla from all of us at the rescue. 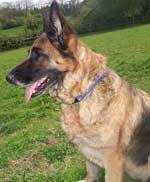 This beautiful big boy BoBo had been in kennels nearly a year. We couldn't understand why nobody wanted to give a home to our lovely Bo Bo. He needed a nice home as an only dog. He will be protective of his home and family. Stig - abandoned and taken to the pound. This poor dog came to us in an appalling state from a dog pound. He needed a loving home asap. This beautiful boy was painfully thin you could feel all his ribs and backbone. His coat was dirty and matted. Stig had been in the pound for some time, overlooked and ignored because of the condition he was in. 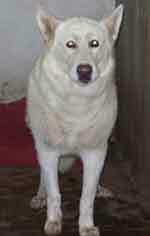 Morgan is a very pretty, playful female German Shepherd born in 1999. She was handed into a rescue Feb this year. She was handed in as the owners couldn't afford to keep her. She had obviously not received the vet treatment she should have done. She is excellent with people, very friendly, she is a bit of an attention seeker, will paw you if she feels she is not getting enough attention. The rescue that took her in gave her one month to find a new home, otherwise, they were going to put her to sleep. 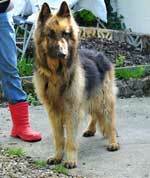 GSDR found a home for Morgan. Jet is a beautiful dog, who has had a rough time. When he was just 5 months old he was hit on his hindquarters by a car and sustained a fractured right hip. 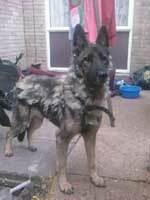 His owner had limited funds and he was treated by the PDSA. Jet had two lots of surgery on his right hind leg. Firstly to repair the fracture by inserting a plate and screws, and then a second operation to remove the ball and socket joint. 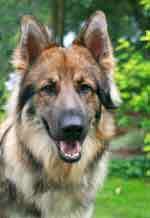 Jet did not lose his leg thanks to GSDR who ensured he got the treatment that he needed. These 2 gorgeous dogs were abandoned in Leeds by their owner and taken to the dog pound. Their owner had telephoned the pound but never went to pick them up. They were destined to die this week as they had reached their date. What do those eyes say? Why have my family abandoned me, what did I do to deserve this? This lovely girl was handed into an Irish pound. Because she was given over by the owners, there was no need for a 7-day wait for reclaim so Willow was put on the list for destruction. We couldn't let that happen so she is coming over to the UK on 29th August. Apparently, Willow is huge - polar bear size and a little overweight so she was once well-cared for. Not surprisingly she has been a little nervous in her luxurious plush kennel!!! 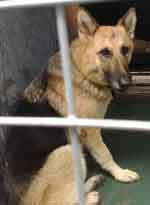 Lottie is a GSD around 3-5 years, she was found a few months ago close to death - she had been stabbed in the head. All her physical scars are well hidden now but she needed a caring and loving new home that will not ask too much of her in the beginning. Lottie needed a caring home, not another kennel and she was at risk because she was taking up space in the hospital that could be used to treat another large dog trauma. She needed someone to help her try and forget what has happened to her in the past. NOW REHOMED? Mack - A Lifetime of Neglect Causing Pain and Suffering. Mack is a good example of what this rescue is about. We have never cherry picked, we don't discriminate on age, health problems or behaviour. We have always tried to help any dog that came our way. Just because Mack has suffered a lifetime of neglect, doesn't mean we should write him off and not bother to help. It would be cheap and simple to put him to sleep, wouldn't it? We raised the funds for Mack to undergo bilateral ear ablation to make him comfortable. Mack also bagged himself a fabulous home. 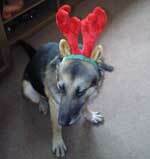 Jake - 8yrs Years Badly Neglected, Underfed. We got Jake out and his new life began. His foster mum got him back on the right track with a good diet and some grooming and adopted him.